In a well-paced hour that mirrored so much of its very first episode, “Winterfell” rewarded our long wait with some wonderfully unexpected moments full of emotion and wit. Recalling Bran’s long ago climb, a young boy races to see the impressive arrival of Dany and Jon’s combined armies; Dothraki, Unsullied, hungry dragons and all. The ultimate Game of Thrones who’s who (of who’s left) this episode reunited nearly one and all, from brothers and sisters to frenemies and flat out foes; nary a minute was wasted and only one fool (Euron) has outstayed his welcome. Speaking of information overload, within minutes of meeting his new queen, Sam is abruptly informed she’s already met — and (burned alive) killed — others in his family, news which he rebounds from exceedingly well. And in turn, with none of the usual television Will-He-Or-Won’t-He fanfare, the best Tarly wastes no time in telling his former Starkness that Jon is, in fact, a Targaryen king. As various gentlemen play at moving their chess pieces, the women in and around Winterfell make no game about staking their own claims; their surefooted confidence only serves to highlight the counterpart male uncertainty. While it may be mostly men who will fight the upcoming war and lay down their lives in sacrifice, one thing has become unwaveringly clear. 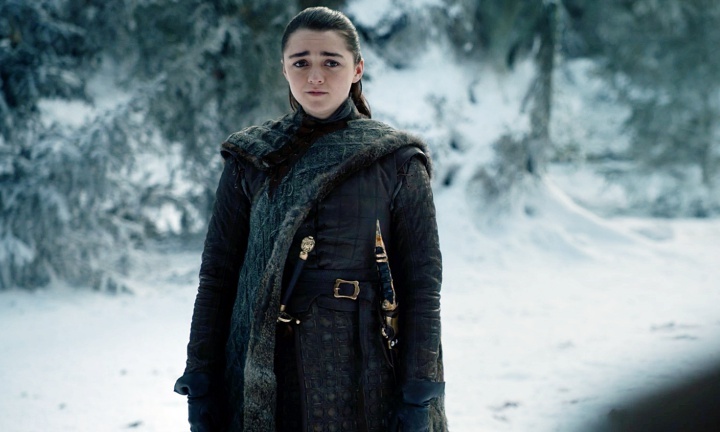 When the smoke clears and the enemy is finally defeated, it is Game of Thrones‘ fiercely intelligent female force — Sansa, Arya, Daenerys — that will rule what is left of the Seven Kingdoms. While the dead have broken through the wall and make their way toward a final showdown, Qyburn interrupts Bronn’s me-time with a Cersei-offer a sellsword seemingly can’t refuse. Marked safe favorites, blue-eyed and otherwise, return in uncertain darkness to missions as yet unknown. The Night King leaves his horrific message and in the endless catacombs, men try to burn away its terrors. 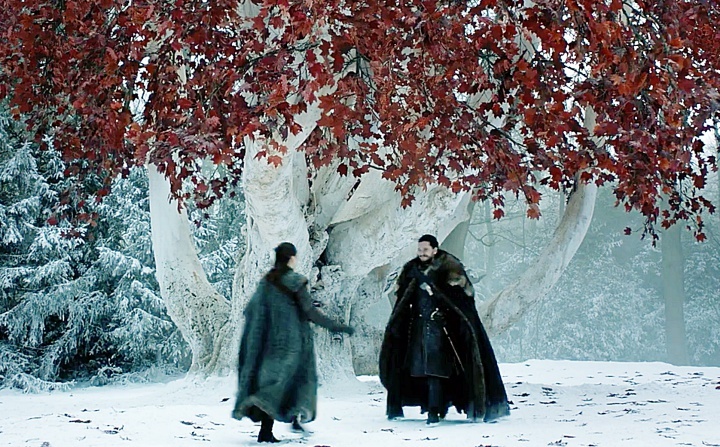 Arya and Jon were really my everything; that reuniting by the Godswood, paralleling their parents in “Winter Is Coming”, was gorgeous, heartfelt, and moving. 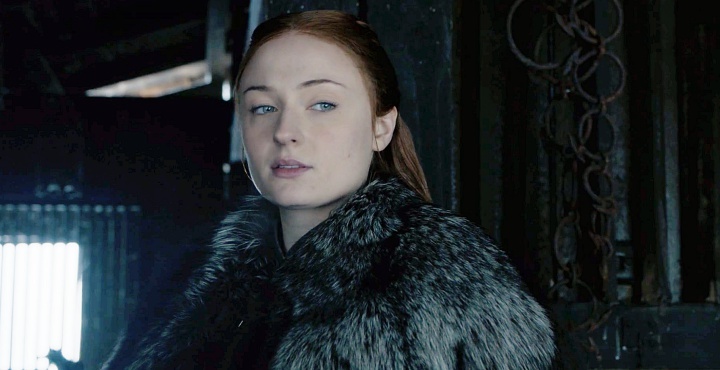 Arya and Sansa have grown in every way, most of all as powerful sisters and allies, and to hear Arya say to Jon that Sansa is the smartest person she knows filled my heart. That said, Jaime’s return at the end, the look on his face as he spied Bran across the courtyard nearly broke me. Is he terrified that Bran will tell someone what he did in “Winter Is Coming”? I’m sure. But I saw something else in Jaime’s expression, something I’m not sure I can explain outside of my gut feeling — redemption. Jaime is changed. I saw the pain in his eyes of knowing who he’s been and the things he’s done, and for what? For the love of his life, for the children he no longer has, for House Lannister, which basically no longer exists. I think Jaime will die a hero’s death, and we’ll remember him as having been redeemed. Qyburn giving Bronn the crossbow Tyrion used on Tywin to kill Jaime? I can’t even … Cersei is almost a non-entity at this point; narcissistic, irrational, and unable to see past her own nose. I found myself barely paying attention to her, knowing we are only waiting to see Maggy the Frog’s prophecy play out, and which valonqar will strangle her. Euron Greyjoy continues to be a bad joke. 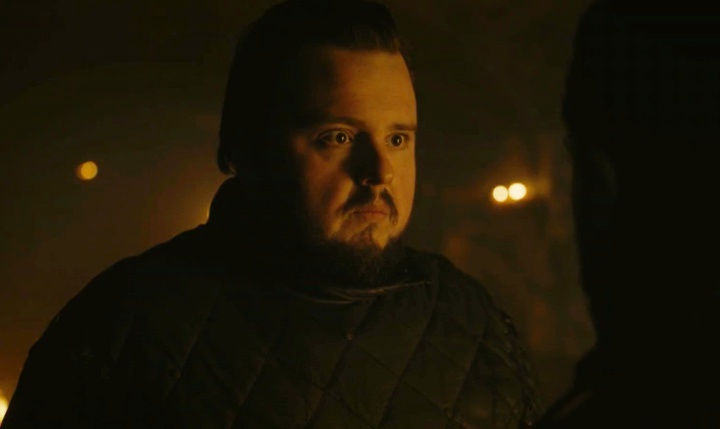 I really dislike what they’ve done with this character and of the whole hour, his bit (although I see its merit as it relates to Cersei) could have been eliminated. That was Marc Rissmann as Harry Strickland (The Golden Company) with Euron. The look on Dany’s face when Bran says her dragon is “one of them now” was heartbreaking. Speaking of Daenerys, Emilia Clarke has really found her way with comedic delivery. Random wondering: if Bran eventually wargs into Night King to save humanity, can he put the dead down as we once saw the Night King raise them? 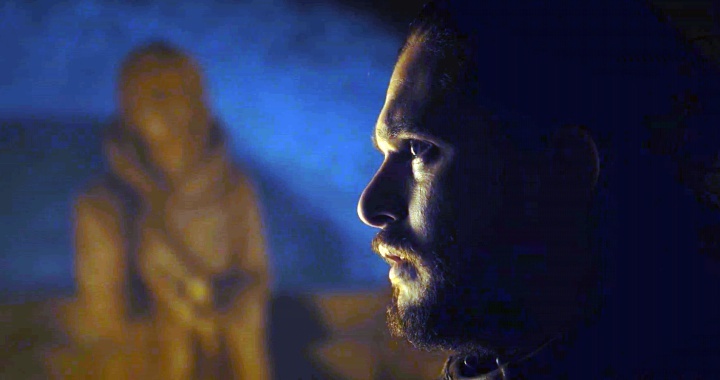 I didn’t mind Dany and Jon kissing so much this episode, which was weird, but not as weird as how Drogon stared them down. There was something about the way the dragon’s eyes and expression were rendered that reminded me of The Planet of the Apes‘ Cornelius before we knew he could speak. That said, Dany was not at all likable this hour, not that she has to be but rather, in a way that feels very intentional. There’ve been hints she’s headed towards Bad/Mad Queen-land and perhaps it will be that Jon has to kill her (or let her be killed). I’ve predicted Game of Thrones will end with mostly women left and running things … maybe Dany won’t be one of them. 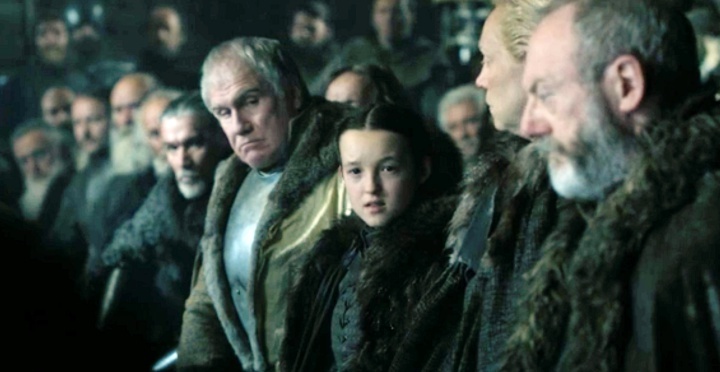 Lady Mormont returned in perfect form. Arya and The Hound had a perfect reunion, and I wonder if she cares enough to keep her death-threat promise. 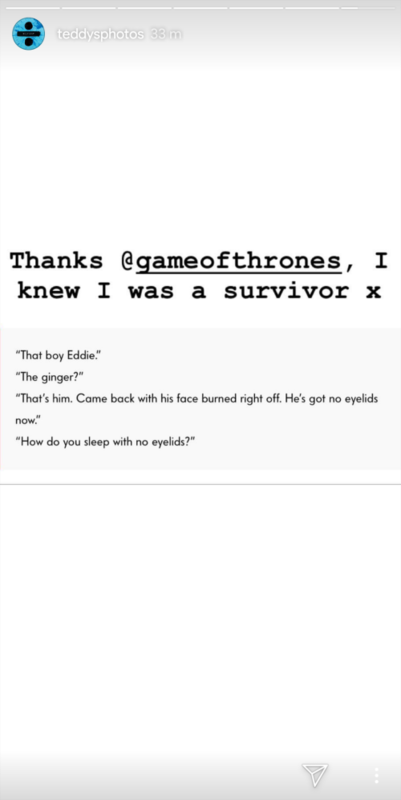 The ginger Bronn’s lady “friends” were chatting about was none other than Ed Sheeran, as acknowledged by the man himself on an Instagram story (H/T Craig). 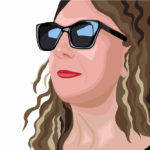 “You want a whore, buy one. You want a queen, earn her.